I write crime stories. Not stories on police tactics or drug organizations but stories about people and how criminal activity affects them. Every novel is about conflict. The people caught in that conflict, whether it’s romantic conflict, physical conflict or conflicted feelings, are what makes a story interesting and compelling. During the day I am a career cop, having worked as a US DEA agent and now as a state cop in Florida. I work with all types of people. White, black, Latin, male and female. When the day is done, it makes no difference if a cop or criminal is considered ethnic or not. A good cop makes an arrest regardless of the criminal’s background. And good cops come from all possible backgrounds. Criminals do what they’re going to do no matter what heritage they may have. I’m not even sure I know what constitutes “ethnic” anymore. I am a Florida-born son of Irish and German parents. I am so white my kids are transparent. But some people would consider Irish-American as ethnic. The stereotype of the Irish NYPD cop is based on tradition. An “ethnic tradition” of service and duty passed on from parent to child. This is based on years of this practice dating from the early 20th century. Have entrance exams and unbiased selection board eliminated this practice? Not really. Consciously or not many NYPD police officers follow the careers of their elder relatives. Is it still an “ethnic tradition”? Make up your own mind. When I decided to write a novel not related to my series featuring Florida Department of Law Enforcement Special Agent Bill Tasker, I wanted to write about a different cop. I also wanted to avoid the TV clichés and write about cops like the ones I know personally. Living in South Florida I drifted toward a Hispanic character and developed the Latin ATF agent Alex Duarte. But I never thought of him as ethnic. 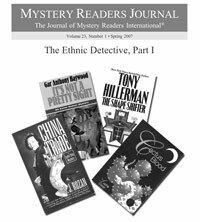 It wasn’t until I spoke with Janet Rudolph about this issue of Mystery Readers International that I consciously realized Duarte was ethnic. In the novel Field of Fire he doesn’t consider himself as ethnic either. It’s not until others point it out to him that Duarte must even consider his background. Part of the novel is his coming to terms with heritage. As a native Floridian raised in the ’60s and ’70s, I consider someone who is of Cuban descent the same as someone who is of Italian or Polish decent. They are neighbors or friends whose parents immigrated from someplace else. Just as my ancestors came from Ireland and Germany, my friends’ ancestors came from one of a dozen different Latin American countries. When I started to write Field of Fire, I wanted a protagonist with his own problems, faults and strengths. He is a former Army combat engineer, which gives him a background to use and understand explosives. But he’s made mistakes. It’s his past that haunts him and keeps him from sleeping and makes him charge into the case of a bombing which kills a young boy. I took several of the issues that I see younger people face today and incorporated them into the story. Duarte lives in a garage apartment with his obnoxious brother. But the apartment is behind his parents’ house—the same house in which he grew up. I once worked with a Federal agent in a similar situation. Living on my own, I was amazed that someone in their late 20s would still live at home. Then I saw it more frequently. Now I’m envious. If I had known then what I know now, my parents would have needed a court order to get me out of the house. Although Duarte’s a smart, good looking guy, his experience with women is limited and he starts to learn more about them as the story unfolds. And like many Latinos living in Florida, his family is extremely important to him. He must answer his father’s daily query, “Did you do good work today?” as well as seek the older man’s advice when the case moves from a single, local bombing to a nationwide series of deadly attacks that is a conspiracy involving individuals on both sides of the law. Although Duarte is what we would consider “ethnic” the real question is, what does he consider himself? When I attended graduate school in Mississippi, I had several friends of French decent that grew up in Louisiana. Since their parents were discriminated against as “Cajuns” they never allowed the kids to speak French around the house. Their reasoning was to make them be more like the kids at school. That also happens with immigrants across the country. It is by no means universal, but it happens. Often, once the children of these immigrants grow up, they miss the links to their heritage and the fact that they could’ve learned a language at home from their parents or perhaps a live-in grand parent. In Field of Fire that is an issue with Alex Duarte. He doesn’t speak Spanish. He must endure looks from older Latinos who start to speak to him in Spanish and he has to ask for them to switch to English. That’s just one of the issues faced by Duarte. I like the idea of writing a different character from my series. Bill Tasker is a middle-class white guy who has his own problems. Not only is Alex Duarte Hispanic, he is single and never married. His issues are different from Tasker’s concerns. And that’s what makes stories interesting: issues. If every book were about how great cops are, there wouldn’t be much to write about. My experiences as a cop may add details and make the investigations I write about more realistic, but I draw on the unusual people I meet everyday. I get to talk to everyone from every social and ethnic group. Just as if everyone in a book is the same, all white or all black or all funny, or all bad, the variety is lost and so is the story. Feel free to let me know what you think. I love hearing from readers. James O. Born is the author of Walking Money, Shock Wave and Escape Clause in the Bill Tasker series. His 2007 novel is a standalone titled Field of Fire (all from Putnam). For more information visit www.jamesoborn.com. Tony Hillerman is famous for his Native American-themed mystery series featuring Navajo tribal police lieutenants, Joe Leaphorn and Jim Chee. Set primarily on reservations in the “Four Corners,” where Arizona, New Mexico, Utah and Colorado meet, his eighteen-book series not only delves into the minds and cultures of Native Americans, but showcases the unique landscapes and panoramic vistas of the American Southwest. Before we look at Hillerman’s creations, Leaphorn and Chee, let’s look at Hillerman himself, and the genesis for staging his mysteries on tribal reservations. He grew up in a town of only 34 people in Sacred Heart, Oklahoma. His neighbors were Potawatomi and Seminoles, and he went to a Native American school through eighth grade. He left home to fight in World War II, returning with a Silver Star and a Purple Heart. A reporter read his wartime letters to his mother and recommended he become a writer. That sounded good to Hillerman, so off he went to journalism school. His first job was writing commercials for Pig Chow, trying to make swine food exciting to farmers, later moving on to become the editor of a Santa Fe, New Mexico newspaper. He yearned, however, to write “the great American novel” and thought a tribal reservation would make an intriguing background. Joe Leaphorn, Navajo tribal police detective, was born. But not everyone shared Hillerman’s insight, as his first novel, The Blessing Way, was initially roundly rejected, even by his own agent, due to the Indian theme. Not only has Hillerman become one of the most recognizable names among mystery writers, he and his savvy publisher have gone beyond creating a popular series; they have created a brand. A quick glance at the titles and unique cover art of every book, both expertly exemplifying Native American culture, tells the consumer it is a Hillerman book as effectively as a Starbucks logo sells coffee. And from a writer’s viewpoint, facing the never-ending challenge of finding intriguing circumstances into which to immerse one’s characters, consider the cultural depth from which Hillerman can mine. In Dance Hall of the Dead a Navajo boy is the suspect in the murder of a young Zuni, who was killed while training for playing the Little Fire God at a tribal festival. Listening Woman tells of an old man and young girl who are murdered, with a blind shaman called Listening Woman blaming restless spirits and supernatural evil. People of Darkness is set on the Checkerboard Reservation, in which the government gave alternating square miles of land to an intermingled different Indians of different tribes, whites, and missionaries representing different religions, allowing a feast of cultural conflicts and observations. In The Dark Wind a corpse’s palms and soles have been “scalped” in a case motivated by vengeance. In A Thief of Time an anthropologist disappears at a moonlit Indian ruin where “thieves of time” steal from the sacred land for profit. Coyote Waits tells of a mythical coyote that figures into a murder where the suspect is a Navajo shaman. In Skeleton Man a tribal trading post robbery leads to a canyon where an old man died trying to build a cult reviving reverence for the Hopi guardian of the underworld. In Hillerman’s most recent book, The Shape Shifter, the star of the book is a mysterious little carpet, a precious Navajo tale-teller rug, full of portents, interwoven with bits of bark and feathers. Supposed to have been burned in a fire years before, it turns up in recent magazine photos of someone’s home. Could a culture—and a setting—possibly deliver any more varied and endless settings and subplots? It seems doubtful, but Hillerman does not stop there. He goes beyond the realm of traditional mystery writer with his clever handling of the conflicts which exist between the many segments of our multi-ethnic society. Specifically, Leaphorn and Chee must face these cultural conflicts—and prejudices—not only as Navajos dealing with whites, but with Indians of different tribes with conflicting beliefs and values. Both the obvious conflicts and the unresolved cultural truces allow for a web of tension and motivations for the protagonists and antagonists alike. Hillerman does this so effectively not just by making Leaphorn and Chee members of the tribal police, setting up these conflicts via their investigations, but by the credibility of their training. Both have college degrees in anthropology. This makes perfect sense—anthropology is the study of mankind’s cultural development and ethnic characteristics. This is ideal for Leaphorn and Chee’s constant need to address and deal with the whites’ prejudices, and their own reactions to it. At times Leaphorn and Chee must even face their own prejudices. For example, in Dance Hall of the Dead, Leaphorn must face his personal prejudices that are interfering with his investigation on a Zuni reservation, their beliefs in conflict with his Navajo upbringing. In The Dark Wind, Chee must intentionally exploit a Hopi ceremony to accomplish his goals, something he would likely not have done in a Navajo setting. By including his protagonists’ struggle with the same issues of prejudice and cultural manipulation, he more effectively deals with the issue than if we are only seeing those acts committed by whites. Hillerman was also wise to expand the series, initially featuring Joe Leaphorn, to include Jim Chee. The two police detectives are both Navajos, but the similarity ends there. He wisely gave them different emotions and reactions. Joe Leaphorn is calm and well-reasoned, and ages toward retirement. Jim Chee was created in People of Darkness by necessity to make the story work. Unlike Leaphorn, Chee is not just younger, but less sophisticated, and more reckless, romantic and idealistic. Hillerman has said he patterned Chee after his students at the University of New Mexico who would often test his patience. Comparing the two, Hillerman has said, “I’ll confess here that Leaphorn is the fellow I’d prefer to have living next door and that we share an awful lot of ideas and attitudes.” Creating Chee has allowed Hillerman to look at the same issues faced by Leaphorn in a different light, similar to two different generations looking at the same event and seeing two different things. Hillerman has accomplished what few writers can do. He has let us enter a Native American world through the eyes of two intelligent and insightful tribal police officers, crafted a subtle social commentary about one of our country’s most misunderstood people, and ended up with tremendously entertaining mystery novels. Randall Hicks is the author of The Baby Game, featuring adoption attorney/club tennis pro, Toby Dillon, winner of the 2006 Gumshoe Award for Best First Novel, and a finalist for the Macavity, Anthony and Barry Awards. His next Toby Dillon mystery, Baby Crimes, and a young adult book, The Stray Cats (WordSlinger Press), as well as a non-fiction, The Ultimate Adoption Guide (Penguin/Putnam) are all due out in late 2007. One aspect of American culture that keeps it alive and vibrant is its ability to absorb what was once outside its purview and incorporate it into the ever-evolving formula that makes us, for better or worse, what we are. Once upon a time, the alcoholic-white guy-loner-P.I., with quick fists, a quicker wit, a taste for blonds and blood, and a stubborn streak as wide as a million mean streets was the ultimate outsider, someone who swam in the sewer with the other scum, a decent person’s last resort. But by the late 50s, when the likes of Peter Gunn and a somewhat scrubbed-up Mike Hammer began to appear on our TV screens, it marked the beginning of the end of the old P.I.’s ultimate outsider status. By the 70s, it seemed, every other show featured a P.I. of one sort or another. So you can imagine the sweet irony I felt this past summer when, as Executive Vice President of Mystery Writers of America, I was called upon to comment on the death of Mickey Spillane. Here I was on CNN, CBS, and BBC radio discussing the man as if he were Shakespeare, when only a few decades earlier he had been reviled for contributing to everything from the degradation of the English language to the downfall of Western Civilization. Frankly, the end of the outsider status was probably a good thing for the genre. With all due respect to Messrs. Hammett, Chandler, et al, the acceptance of the P.I. into the mainstream spawned the Golden Age of P.I. writing. Yet, there is something quite intoxicating about living on the fringes of society and that outsider status has great appeal, especially in America. We do have a soft spot for lone wolves and outlaws. So it was a natural progression for people who were actual outsiders to pick up the ball and run with it. These were people didn’t need to create personal mythologies for their detectives to explain a fall from grace, because their status as outsiders derived not from what they had done or not done, but rather from what and who they were. Women, gays, and ethnic minorities were the de facto heirs of the outsider status. I count Moe Prager among their number. Historically, Jews had been forced to live at the cultural edges of the countries they inhabited. Until the founding of modern Israel, Jews had existed for thousands of years as a people condemned to permanent minority and outsider status. In Europe it was this exclusion from the greater culture, from unions and trade guilds of the countries they inhabited, which led Jews to go into professions like banking and the diamond trade, things their predominantly Christian hosts found either distasteful or beneath them. The roots of Jewish stereotypes have, like the roots of most stereotypes, their basis in fact. This exclusion also led to the evolution of a separate Yiddish language and culture, which had their origins only partially in religion and were in many ways reflections of a life of exclusion and the ghettoization of a people. This made for a culture that crossed larger cultural and geographic borders, allowing Jews living in different countries to communicate and share the experiences of life at the fringes. These things are all fodder for interesting discussions, but what fascinates me as a writer of P.I. fiction is the mindset of the outsider and the persistence of that mindset. On my dad’s side of the family, I’m a third generation American. On my mom’s, a second generation American. My wife is a Lutheran from Michigan who is part Chippewa and Cree on one side of her family and related to Betsy Ross on the other. I’ve come to think of my kids as Jewtherans. I am the ultimate assimilated Jew. Yet, I continue to struggle, as does my protagonist, Moe Prager, with the mindset of the outsider. Although I never once heard my parents or any of my relatives say the words, the message was loud and clear: “Don’t make waves.” My family’s real last name is Cohen, but my dad changed it to Coleman after WWII in hopes of avoiding anti-Semitism and landing a job outside New York. The constitution of the United States of America poses some interesting questions for Jews. Yes, we’re free to practice our religion openly and without consequence. But the fact is we’re as small or smaller minority in America than in most of the old European countries in which we lived. And is there such a thing as no consequences? Does assimilation offer freedom or invisibility? Is assimilation a means of survival or destruction? When fans ask how much of Moe Prager is me, I usually say that we’re from the same neighborhood and that we went to the same high school. In point of fact, that piece of Moe which is most like me is that part of him struggling with his Judaism and its implications. As I wrote recently for a piece in this year’s Edgar Award Annual, the P.I. novel is, in my opinion, the best subgenre of mystery in which to explore the human condition. Because the P.I. represents the one against the many, the citizen against the state, and because his or her authority derives not from the state, but from the search for justice as opposed to convenience and truth as opposed to justice, his or her story provides the ripest environment in which to explore social, cultural, philosophical, and emotional issues. See, it’s that outsider thing again. When I conceive of a novel, my first concern is to come up with an entertaining plot that will keep the reader’s interest and engage his or her emotions. However, when conceiving of a protagonist, I take other things into consideration. Ultimately, a character with whom I will be forced to share endless amounts of time, must interest me beyond the ability to simply be entertaining. He or she must afford me the opportunity to explore ideas, arguments, theories, beliefs, philosophies, and dreams. If the writer is not engaged, how can he hope to engage the reader? Moe Prager has afforded me the chance to delve deeply into the area of my own problematical relationship with Judaism. In many ways, I set up Moe as an allegorical figure. First off, his name is really Moses. His brother’s name is Aaron and his sister is Miriam. How Old Testament, I know. Like the Jews of Europe living in countries where they were in the overwhelming minority, Moe, as a member of the NYPD in the late 60s and 70s, is in the overwhelming minority. His police career is basically unremarkable. He does his job and he doesn’t make waves. He tries to fit in. When he does accomplish something heroic—the rescue of a missing little girl—Moe receives praise and commendations, but not a gold shield. This gnaws at him. Why didn’t he get his detective’s shield? Was it really the city’s budget crisis or anti-Semitism? The fact that he is a cop at all is somewhat startling. As I once wrote, Jews have an abiding respect for the law, but a deep distrust of those who enforce it. In the first book in the series, Walking the Perfect Square, Moe, who has been forced to retire from the NYPD due to a freak accident, is hired to search for a missing college boy. During the course of his investigation, Moe meets, falls in love, and marries the missing boy’s sister. Katy is a Catholic who converts to Judaism of her own accord. Moe is astonished by this. Why would anyone volunteer to be Jewish? Moe does his deepest soul searching on the subject of his religion in the second book in the series, Redemption Street. Moe goes to the Catskill Mountains in upstate New York to investigate an old hotel fire that killed three girls from his high school class. During the 30s, 40s, 50s, and 60s, the Catskills were the Jewish Alps; a summer retreat consisting of hotels, motels, and bungalow colonies, that catered to the cultural and dietary needs of European Jews. But in recent decades, the Catskills have become a haven for ultra-orthodox Hasidic Jews. In Redemption Street, Moe is in constant discomfort because the cast of characters that surrounds him is symbolic of the varying parts of his own mixed feelings. I have divided his conflict up into representative groups: Hasids, White Supremicists, the Yellow Stars (a secular anti-assimilationist cult). I further split Moe’s struggle up into the Freudian constructs of id, ego, and superego. The id is Sam Gutterman, a foul-mouthed Borscht Belt comedian and owner of the Swan Song Hotel. The ego is Israel Roth, a sagacious concentration camp survivor. And the superego is represented by the mysterious Judas Wannsee, leader of the Yellow Stars. All three men vie for Moe’s Jewish soul. Of the three, Wannsee is most representative of Moe’s internal struggle. Even his name—Judas, the betrayer of Christ, the most loathed Jew of all time and Wannsee, for the Wannsee Conference, where the details of the Third Reich’s Final Solution were hammered out—is meant to draw maximum attention to the struggle. During a long impassioned speech, Wannsee gets to the heart of Moe’s internal dilemma. Unfortunately, Redemption Street was my least successful Moe book and it received generally harsh reviews. Some of those reviews, in fact, questioned my right to discuss such a serious topic on the pages of a P.I. novel. Of course, I think that’s an absurd assertion. Although the book was commercially unsuccessful, I am most proud of it. In it, I did what writers need to do. I took chances. In the end, it is Mr. Roth who wins the struggle for Moe’s Jewish soul. In The James Deans, Mr. Roth buys Jewish stars for Moe, his wife, and their daughter. And by the end of the book, Moe seems to have reached some sort of internal peace not only about his religion, but about that detective’s shield he felt should have been his. Both my struggle and Moe’s will continue and I will continue to argue that the view from the fringes offers the most interesting view of all. Reed Farrel Coleman is the author of eight novels. The James Deans, his third Moe Prager Mystery, won the Shamus, Barry and Anthony Awards and was nominated for the Edgar, Macavity, and Gumshoe. Soul Patch, sequel to The James Deans, will be released in April 2007. Visit www.reedcoleman.com.